Rugby bowed out of the league cup competition at Butlin Road on Tuesday evening, but in doing so they were far from disgraced against a side challenging near the top of the league’s Premier Division, writes Jon Venner. Having conceded two goals within the first seven minutes, Valley arguably went on to have the best of the remainder of the match, with Richard Blythe deservedly pulling one back for the hosts with a quarter of an hour remaining. 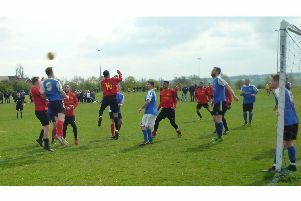 However the Steelmen rallied in the closing stages to score again and ultimately book their place in the semi-final. Town made three changes from the weekend, with Lewis McBride, Mitchell Piggon and Fazel Koriya all starting – McBride ending up in an unfamiliar full-back role following the very late withdrawal of Craig Kelly. The visitors took the lead after just two minutes, when poor marking from a Greg Mills’ corner left Cleveland Taylor with an easy finish from a couple of yards out. Koriya almost levelled things up immediately though, when he ran onto Lewis Rankin’s defence-splitting pass to help the ball through the legs of the oncoming keeper Sam Donkin – only to see it lack the necessary momentum to roll over the line. However Corby’s second was soon in the bag, when a speculative scoop from out wide by Elliott Chamberlain somehow evaded Richard Morris in the Rugby goal and ended up in back of the net. Donkin then did well to beat away a sharp shot on the turn from Rankin, with Piggon also going close for the home side when curling one just wide. At the other end Chamberlain and Mills had back-to-back chances to bury the game before the interval, but both efforts were blocked out by the home defence. Rugby played their best football of the game after the restart, with Rankin generally at the heart of their most promising moves. The ex-Coventry City academy man put one decent effort over the bar, and also saw a goal-bound header blocked on the line, after Will Grocott’s initial header had suffered the same fate. Valley finally struck when Blythe ran onto Marsden’s pass to coolly skip round Donkin to ease the ball home, and at that point hopes were high that an equaliser could then be fashioned. However it was the Premier outfit that instead raised their game from that point, and Morris was quickly forced into making a flying save to Paul Malone’s header. Corby sub Kurtis Revan went close on a couple of occasions and fellow replacement Shane Byrne was also narrowly off-target with his shot, before Spencer Weir-Daley sealed things in the 89th minute with a close range finish after Rugby had failed to clear their lines.